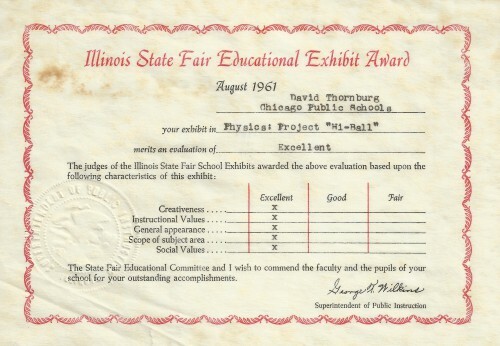 The story behind this discovery dates back to the 1970’s when I used to volunteer as a math resource specialist at a small school near my office. One day, a teacher introduced me to a 10 year-old girl (we will call her “Ann”) who was (in the teacher’s words) “bad at math.” I found that to be strange announcement since, in my view, Ann had never been exposed to math, but only to arithmetic. So one day I invited my class to do an experiment. I brought my own bucket of pattern blocks to school, in which I added some regular pentagons I had made. Piles of the same shapes were put on several desks, and students were asked to tile the surface with just one shape – and I made sure Ann was at the table with the regular pentagons. After a few minutes, all the students had succeeded – excepting those at the table with the pentagons. No matter how hard they tried, there was always going to be a gap. I was delighted to hear that question because this is the kind of question mathematicians ask themselves often. Ann told me she wanted to experiment more with the pentagons, and I gave her a bunch to take home so she could report her findings the next week when we met again. At this point I didn’t know what to expect, but it sure wasn’t what she showed up with. Then, she said, just keep repeating this process. You will always need some grout, but the picture should be very pretty. As you can see, Ann was quite right. Yes, you still need grout, and, the resulting pattern is quite pretty. I lost touch with Ann, but talked with her on her first day of college at UC Berkeley, where she was majoring in mathematics. I’m glad I may have played a small role in helping her see the beauty in this subject, and have no doubt that she has gone on to do great things. I’m also happy to finally share her discovery with others in the hope that it encourages other teachers to move beyond arithmetic to see the beauty in real mathematics, as encouraged by the Common Core State Standards for mathematics. Our workshops on CCSS Math can be scheduled by e-mailing me at dthornburg@aol.com Also, our work with pentagon tiling has continued in a new way. 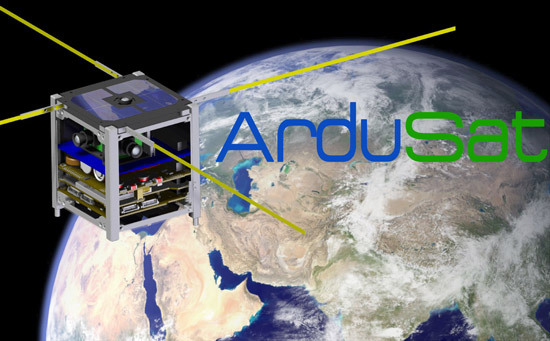 See pentiles.wordpress.com to see what we’re doing in this area! I want to start with an observation about the Common Core State Standards for mathematics. In the past, I have been openly critical of many standards, but I find the central ideas behind this set quite appealing. The key point is that these standards point the way toward student understanding of critical mathematical ideas, not just the memorization and regurgitation of facts quickly forgotten after the test. These are all wonderful ideas that directly relate to how mathematicians work. The challenge is how these can be implemented in the teaching of mathematics. One example I find interesting is to see how we can use 3D printers in the math classroom in support of these core ideas. For example (and I have several), consider the construction of polyhedra using plastic struts and rubber bands. These shapes are called tensigrity structures first popularized by Buckminster Fuller. The idea is that a three-dimensional structure can be built with only two kinds of elements – those in compressions (the struts) and those in tension (the rubber bands. 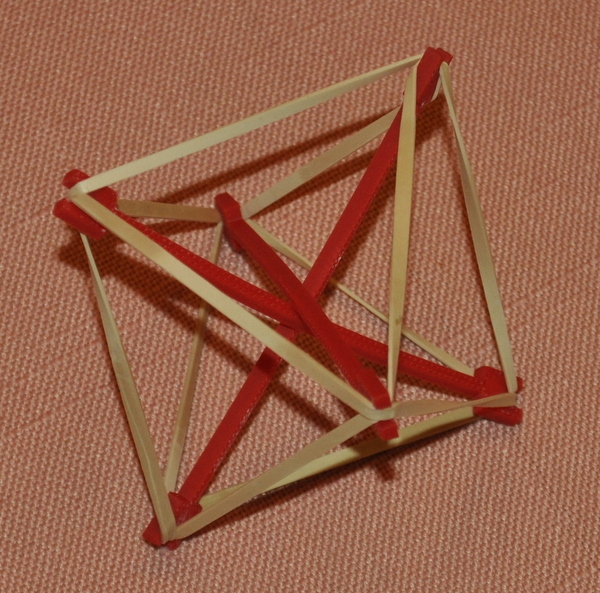 For example, the following image shows an octahedron built with three struts and eight rubber bands. This simple structure is easy to assemble, and numerous other polyhedra can be built the same way. But you might be asking where the math comes in. This polyhedron has 8 faces, 6 vertices (corners) and 12 edges. What relation, if any, exists between the number of faces, edges, and vertices of polyhedra? If you can find a relationship, how can you prove it works for any polyhedron? These questions all derive from the design and construction of a kit for making polyhedra, and the questions we ask cover quite a few of the key concepts for the Common Core math standards. Imagine how activities like this might make math exciting for kids who currently fail to see why math can be an interesting topic!